National airlines Asiana Air (http://flyasiana.com) and Korean Air (www.koreanair.com) run frequent services around the country. International flights primarily leave from Incheon International Airport, while domestic flights fly to/from Gimpo. Usually included in the air fare. Air travel within South Korea can be quite reasonable if you book online. Discounts often rival train fares. Roads are good quality and well-signed, but erratic drivers and traffic congestion in large cities make driving a challenge for all but the most confident drivers. Excellent motorways link all major cities, but minor roads may be poorly maintained. Road signs are usually written in Korean and English. Numerous international and local car hire companies operate in South Korea. However, complex road systems and high traffic density may mean this is an option only for more confident drivers. Alternatively, you can hire a driver to go with you on the road. Taxis are ubiquitous and are reasonably safe and cheap. There are two grades of taxi - a black luxury grade and a normal grade. All taxis are required to be metered; make sure they're using the meter throughout the trip. Reports of lengthy detours, of charging night rates during the day, and other fee-related issues surface from time to time. Safety problems are rare, but assaults on women have been infrequently reported. Exercise judgement and caution when travelling alone. Bike rentals may be possible for sightseeing in some cities. Ask the local tourist information booths for details. Bus travel within South Korea is reliable and inexpensive, but often confusing for non-Korean speakers, as many cities have four or more bus terminals, each with different destinations, routes, and timetables. Making matters worse, many bus operators do not have English speakers or English websites. However, long-distance luxury coaches and normal buses offer service to almost everywhere in South Korea at very reasonable prices. Kobus (www.kobus.co.kr/web/eng/index.jsp) is an English website with scheduling information for all express buses. Speed limits are 60kph (37mph) on regular roads and 80-120kph (50-75mph) on expressways. Contact the Korea Automobile Association (tel: +82 2 565 7001) or check with your car hire company. International Driving Permit required. Drivers must have more than one year's driving experience, be in possession of a valid passport, and be over 21 years of age. Seoul has underground and suburban railways and well-developed bus services, all of which are very crowded during the rush hour. Underground station names, ticket counters and transfer signs are clearly marked in English as well as Korean. Underground lines are colour-coded, and all trains have multilingual announcements. Taxis are widely available. Good bus services also operate in other cities. Most major cities have at least one or two underground lines and/or above-ground trolleys. Korail (www.korail.com) connects major destinations. There are three classes of trains: Korea Train Express (KTX, the country's high-speed, two-class service); Saemaeul trains (express, first class-grade service); and Mugunghwa trains (local, more of a 'second class' service). KTX has east (Gyeongbu line, ending in Busan) and west (the Honam line ending in Mokpo) routings. Station signs in English are common and English translations of timetables are usually available. The high-speed train from Seoul to Busan takes 2 hours 35 minutes, and from Seoul to Chuncheon takes 1 hour 20 minutes. A private high speed operator, the Super Rapid Train (SRT), which travels from Seoul to Busan/Mokpo, started in December 2016 but the website is currently in Korean only (https://etk.srail.co.kr). Korail also runs a network of special tourist trains in summer. Korea Rail Pass: allows visitors travel with reserved seats on any KR train (except subways) within a one-, three-, five- or seven-day period. Saver passes are available for groups of between two and five people, and Youth passes for people aged between 13 and 25 years old. For details and a pass, see www.letskorail.com. Korea Rail Pack: includes accommodation and sightseeing services as well as the actual rail journey. 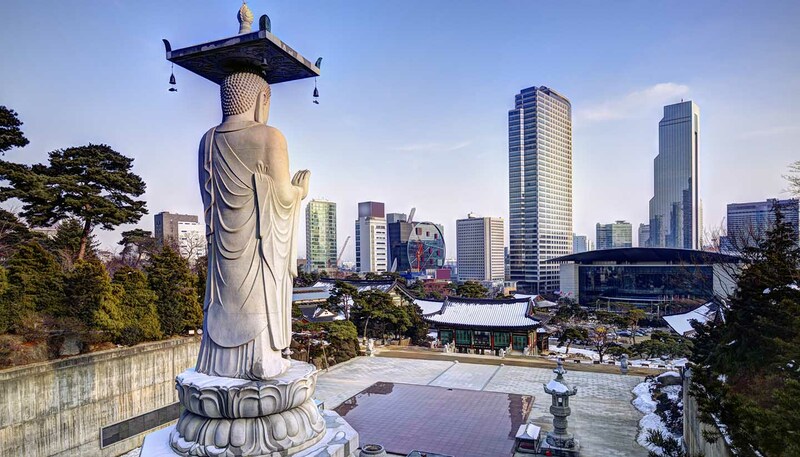 Packs include a free pick-up/drop-off service for major hotels in downtown Seoul, hotel accommodation with breakfast and an English-speaking guide throughout. Routes covered include: Seoul-Gyeongju, Seoul-Busan, Seoul-Gyeongju-Busan, Seoul-Gyeongju-Busan-Jeju and Seoul-Gyeongju-Andong. There are ferry terminals at: Incheon, Gyeokpo, Mokpo, Yeosu, Jeju, Gunsan, Wando, Tongyeong, Geoje, Donghae and Boryeong, connecting port to port and out to some of the smaller islands. Ferries connect Busan with Jeju Island. Car ferries also operate this route. Cruises operate on the Han River in Seoul, which runs through the centre of the capital from Yeoido.